Bayou Cajun Termite and Pest Control is an industry-leading, family owned and operated full service termite and pest extermination company. At Bayou, we pride ourselves on treating our staff and customers like members of our family and, because of this philosophy, we've become a trusted resource for dependable, quality service in our community. The Agent who did our termite inspection was thorough and time conscious. He was also very polite and informative of his profession. We will consider Bayou Cajun Termite and Pest Control for our home. Thank you. Bayou Cajun Pest has taken care of our home for years. They are professional, friendly and efficient. We will continue to use them for the foreseeable future. Been with this service for years. Great service people, excellent product that works. Reasonable cost. And if you have a problem, just call and they are there. Excellent service. Bayou Cajun Termite & Pest control service is individualized for you home or your needs. The service person is very friendly and considerate of your home, pets, and family. Thanks for a job well done! Very thorough in intial termite treatment. Impressed at how tech drilled all concrete attached to house slab to be sure barrier of chemicals was a solid wall. Cajun is of of those hard to find honest and friendly businesses. Have been a customer for many years. SERVICE IS GOOD & CONSISTENT, NO PESTS, NO PROBLEMS EXCEPT BILLING IS SOMEWHAT CONFUSING. IF MONTHLY INVOICES CAN BE E-MAILED, SIGN ME UP. I've had a contact with Bayou Cajun Termite Control for more than 30 years. That alone speaks volumes. They are thorough and fair. The technician know what they are doing and the office staff is always friendly and and kind. We've used Bayou Cajun for at least 10 years. We couldn't be happier with their service, and their contract price for treatment and annual inspections is probably the best in town. Their staff is always extremely friendly and efficient, helpful w/ reminders and online invoicing, and thorough inspections each year. We have had our house under contract for over 7 years now and they do a wonderful job. We recently sold and needed a termite certificate and they came out and promptly did it for us. I would recommend you to others.Your services has been outstanding. Hopefully it will continue. Bayou has been our termite inspector since we purchased our home 14 years ago. They have been faithful to remind us each year when our inspection is due. And are flexible setting timely appointments. Bayou Cajun keeps the bugs away. With all the worries of our recent flood this was one problem I did not have. I felt confident in the knowledge that Bayou Cajun had my best interest in mind as well as that of my home. Phillip is always courteous and prompt. Living in Louisiana, maintained pest control is a must. Bayou Cajun always makes sure to contact our clients when it's time for them to renew for termite protection. That's always something most of us forget to schedule! I never have to call to make appointment. Bayou Cajun contacts me ahead of time. They do great work with no mess left behind and give me a detail report. 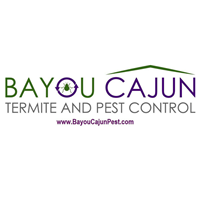 We are very pleased with the service that we receive from Bayou Cajun Termite & Pest Control. We are scheduled for a monthly spraying and they always show up in a timely manner.